A new Daybreak dementia day club for Witney? 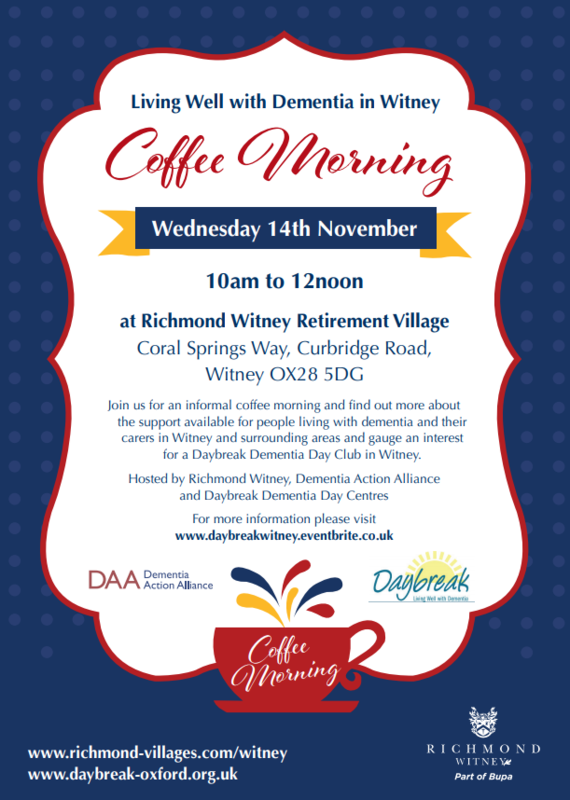 On Wednesday 14th November, Daybreak will be joining Dementia Action Alliance at Richmond Village, Witney to gauge the interest for a Daybreak dementia day club in the town. Join us for an informal, free coffee morning and find out more about the support available for people living with dementia and their carers in Witney and the surrounding areas. The coffee morning will run from 10am until 12 noon, and will of course feature cakes and biscuits and plenty of tea and coffee, while we discuss the needs of the town in relation to living well with dementia. There will be an opportunity to meet other people in your community that are living with dementia, or are family members caring for someone living with dementia, information to take away on the day and carer support staff available to discuss more practical matters and guide you through the minefield of dementia support. We hope to see many of you on the day, the event is free, but booking is essential so we don’t run out of refreshments! Please book using the Daybreak Eventbrite page.